After the straight-ahead mod punkiness of 'in The City' and 'This Is The Modern World, The Jam regrouped and refocused for 'All Mod Cons', an album that marked a great leap in songwriting maturity and sense of purpose. For the first time, Paul Weller built, rather than fell back, upon his influences, carving a distinct voice all his own; he employed a story-style narrative with invented characters and vivid British imagery à la Ray Davies to make incisive social commentary - all in a musically irresistible package. 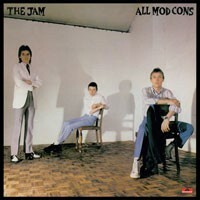 The youthful perspective and impassioned delivery on 'All Mod Cons' first earned Weller the "voice of a generation" tag, and it certainly captures a moment in time, but really, the feelings and sentiments expressed on the album just as easily speak to any future generation of young people. Terms like "classic" are often bandied about, but in the case of 'All Mod Cons', it is certainly deserved.